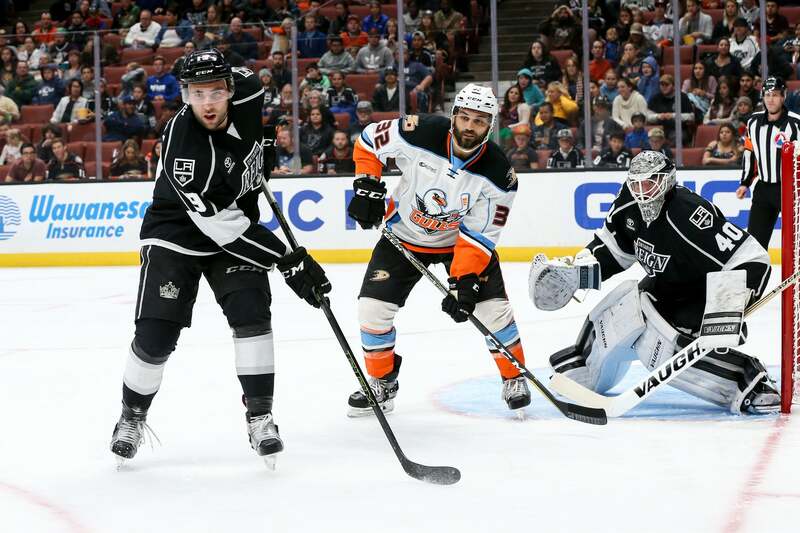 Anaheim, CA – With the last preseason game in the home of the Anaheim Ducks, the Ontario Reign (3-0-0-0) started the game off in a scrappy effort and had a strong scoring second period ending in a 2-1 victory against the San Diego Gulls (0-2-0-1) at Honda Center Monday night. The Reign finished the preseason with a perfect 3-0-0-0 record. The Reign held the San Diego Gulls scoreless in the first period, but racked up six total penalty minutes with infractions committed by Jamie Devane, Matt Schmalz, and Sean Walker. The Reign failed to capitalize on a pair of power-play opportunities against the Gulls including a 5-on-3 for 1:39. The Gulls starting goalie Kevin Boyle consistently denied the Reign, holding his own in a 5-3 mismatch on the Reign’s second power play of the game. The Reign fired 12 shots on goal in the opening frame. In the net for Ontario, Cal Petersen defended all seven shots on goal by the Gulls. The Reign grabbed a fast 2-1 lead to begin the second period. The first two goals of the game came almost back-to-back with the first by Ontario’s Matt Schmalz with Sam Herr and Zac Leslie on the assists. The Gulls followed the Reign’s tally with one of their own by Giovanni Fiore with the assist from Kalle Kossilla. Ontario went back in front thanks to T.J. Hensick, his third of the preseason, and an assist from Philippe Maillet after an Official’s review of the play. With 9:48 to go in the period, the Reign switched goalies, bringing in Jeff Zatkoff for Petersen. The Reign continued to lead the way with overall shots on goal with 22 total compared to the Gulls’ 18. The final period began and ended slowly with another scoreless stanza to wrap up the preseason at Honda Center, but the Reign prevail in a 2-1 victory over the San Diego Gulls. In an all-out effort to try and tie the game, the Gulls played the last 1:17 with an empty net, but came up short. The 2017-18 season opens on Saturday, October 7 against the San Antonio Rampage at 5:00 PT at AT&T Center in San Antonio, Texas. Follow along with the action LIVE at OntarioReign.com!